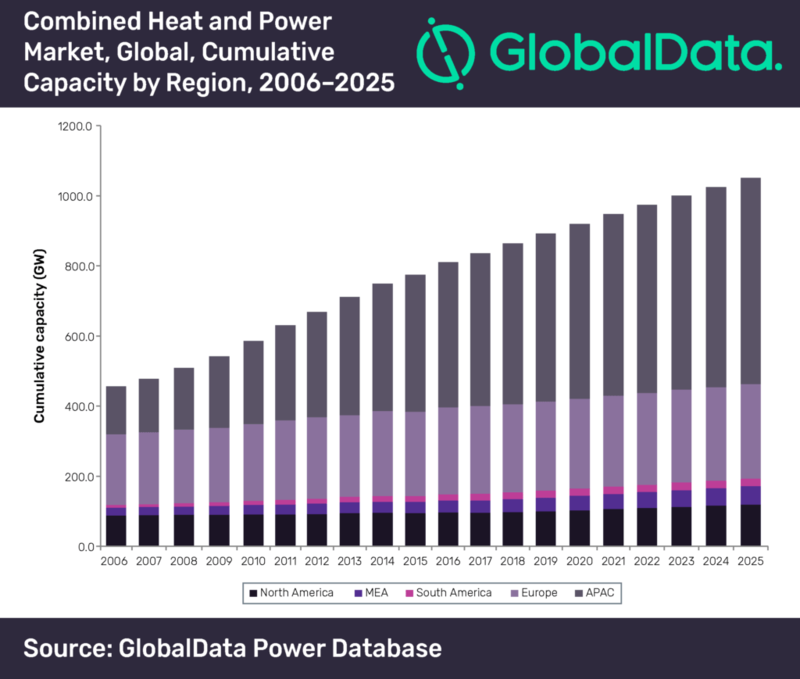 Asia-Pacific (APAC) is expected to remain the largest combined heat and power (CHP) market in the world due to an increase in capacity installations, led by countries such as China, India and Japan, according to GlobalData, a leading data and analytics company. The company’s latest report ‘Combined Heat and Power Market, Update 2019– Global Market Size, Segmentation, Regulations, and Key Country Analysis to 2025’ reveals that the global CHP capacity is estimated to grow significantly from 864.2 gigawatt (GW) in 2018 to 1,050.5 GW in 2025, due to significant capacity additions by China and India. Agarwal adds: “CHP capacity in China increased significantly at a CAGR of 13% from 79.8 GW in 2006 to 347.6 GW in 2018. The cumulative capacity increased especially during 2010–2013 and 2014–2017. More than 90% of the total installed capacity is fed by coal. During 2019–2025, the cumulative capacity of China is expected to increase from 363.3 GW to 434.4 GW at a CAGR of 3.0%. A specific rule calling for companies to switch off and replace coal-fired boilers prompted a number of companies to replace coal plants with gas-fired CHP systems. China also plans to add over 12 GW of biomass cogeneration capacity by 2020 and around 25 GW biomass CHP capacity by 2035. Auction-based competitive bidding has become a popular mechanism in recent years to drive CHP in most of the key markets. Countries including the UK, Germany and France have auction mechanism for various technologies including CHP. Germany introduced its first regular CHP auction in December 2017, in which 82 megawatt (MW) capacity was awarded at an average price of $46.10/ megawatt hour (MWh). Apart from regular CHP auctions, Germany also introduced innovative tenders to determine the role of CHP plants in decarbonizing power and heat supply. The innovative tenders in Germany allocated 21 MW in June 2018 and attracted three bids of 13 MW in December 2018.